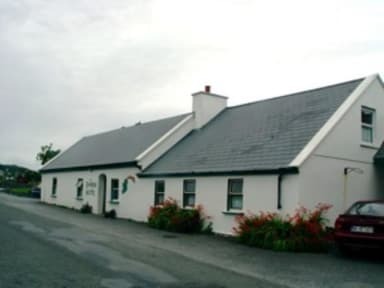 Our small hostel is family run, in the heart of Doolin. It is a traditional farmhouse built in the 18th century. The Rainbow Hostel was established in 1986 with just 12 beds. The building was sympathetically renovated in Spring 2003 into a simple, easy going, warm, friendly and bright coloured hostel. We have kept the high pine wood ceilings (traditional farmhouse style) in the common room and in all the bedrooms. This allows for a better circulation of air in the rooms and this, incorporated with under floor heating, creates a healthy warm room in which to relax and sleep in. Facilities: Common room with turf fire stove, self catering kitchen, private twin and double en suite bedrooms, mixed and private dormitory bedrooms (all en suite), our twin room has one double and single bed with its own shower and toilet, free hot showers and towels, washing and drying facilities, WiFi free of charge. Discount bike hire, free guided walk and slide show of local area, available free to hostel guests, free car parking and bicycle lock up. Local Activities: Visit Doolin Cave, Ferries to Aran Islands/Cliffs of Moher, Burren Walks, Pitch/Putt, Golf, Rock Climbing, Caving, Cycling, Horse Riding, Archaeological/Heritage sites, Surfing, Angling, Diving. Rainbow Hostel is situated in the heart of the village beside some of Doolins famous traditional music pubs, restaurants and craft shops We can help organise your visit to Doolin, the Burren area, Cliffs of Moher and the Aran Islands with local maps and advice on the best sites and activities during your stay with us. We also give a free two-hour free guided heritage walk in the Burren landscape of Doolin at evening time or by request for those staying with us. Advice: If coming by Bus Eireann, please ask the bus driver to stop at the Rainbow Hostel bus stop. Check in closes at 21.00. Great hostel, had a fantastic stay. Friendly, great location. Would definitely stay again! I had a wonderfull time in this hostel. It was very welcomming and the fireplace was perfect to dry my clothes after a rainy day. Thank you very much to let me feel so welcome and at home. Aanbeveling! Leuk hostel met een gezellige huiselijke sfeer en vriendelijk personeel. Kamers en sanitaire voorzieningen voldoen ook. Mogelijkheid om waardevolle spullen in op te bergen was aanwezig dacht ik. Zelf geen gebruik van gemaakt. Very nice youth hostel with large kitchen, the room was all right but we couldn't make all the windows dark ( a very high window in the ceiling) so we used to wake up in the morning very (too) early. We had a private room, which was very basic (one bulb for the light). We had to ask for towels and blankets, there was no heating. The living room is cosy with a wood-heating. Two nice pubs with live music on 100 meter.